Today in KISStory - May 18th, 1993: KISS featuring Paul Stanley, Gene Simmons and Bruce Kulick were inducted into Hollywood's famed RockWalk. At the ceremony in front of fans, friends and family, Paul, Gene and Bruce spoke to the crowd and then left impressions of their hand prints in a block of cement. After adding plates of the KISS logo and their signatures, the stone plaque was later added to RockWalk located at the site of the famed Oriental Theatre now Guitar Center Hollywood. 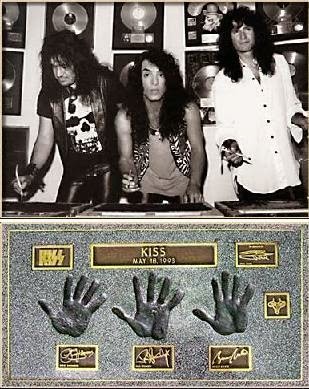 Eric Carr was posthumously inducted into the Rock Walk in 1995 and added to the KISS plaque.